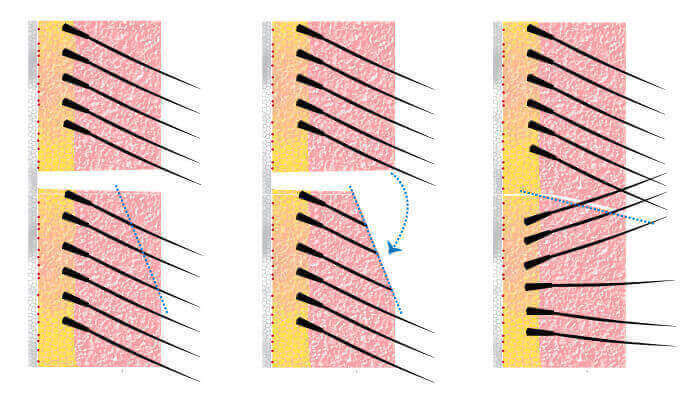 Trichophytic closure involves sculpting the open flaps of scalp in a way that allows one flap to overlap the other. The method hides the edge of one flap, immediately reducing the visibility of the forming scar. The angle of the incision means that existing hair follicles from one side will grow through the other side, creating an even tighter bond and making the scar very hard to see, even with a short hair cut. The trichophytic method can allow hair transplant patients to wear short hairstyles without the fear of exposing a surgical scar. Watch this video and see if you can spot the scars – each patient featured is a recipient of trichophytic closure. In addition to being the Solace preferred method of closure for hair transplants, we can also use trichophytic closure to repair scars left by previous surgeries. Older closure methods can leave wider, uneven, visible scars that can often be repaired using “tricho”. While most patients are candidates for this method of closure, some skin types and other factors can rule out its’ use.